Whether or not Kentucky actually has any mountains is a matter of argument. Westerners, where valleys are higher than our highest peaks, consider these hills. But Kentuckians insist on referring to Eastern Kentucky as "The Mountains." This is because the terrain is so rough. The peaks may only go to 6600 feet, but there are cliffs which plunge straight down to narrow, winding ravines. There are isolated hollows with no paved roads. Places are out of range of cell phones or GPS devices. It is a sparsely settled, wild, rugged part of the country which often seems locked in the 1800s. There's no true city in the whole region. But there is plenty to see. 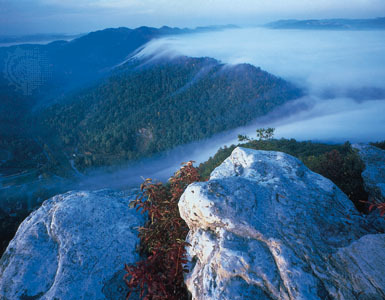 There are state and national parks, national forests, spectacular overlooks and scenic valleys. Restaurants are few and far between, especially if you ignore fast food outlets. But there are some, and they're well worth the time and effort needed to drive over winding mountain roads to find them. The state parks contain many of them. So do the towns of Pikeville, Hazard and Ashland. The rest are scattered through the small county seat villages and remote mountain locations. 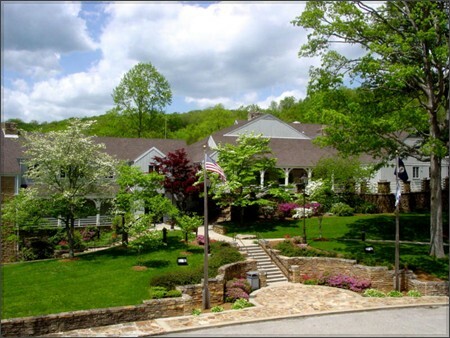 We believe that currently The Benham Schoolhouse Inn in Harlan County is the finest restaurant in the mountains. This is the former Benham High School, beautifully remodelled after the school closed in 1992. It's an inn, with the classrooms remodelled as guest rooms. The restaurant is in the former gym. Regular dinners are served on Thursday, Fridays, and Saturdays for the general public and on other evenings for groups by reservations. Lunch is served Wednesdays, Thursdays and Fridays. Prices are reasonable and the food is great. The dinner menu includes Fried Chicken, Pepper Steak, Chicken Lasagna, Roast Beef, Chicken & Dumplings, Pork Chops, Meatloaf and Turkey & Dressing. All entrees come with a tossed garden salad and two vegetables. There's a Sunday Breakfast Buffet from 11-2. The array includes Bacon, Sausage, Ham, Scrambled Eggs, Fried Potatoes, Fruit Bar, Biscuits & Gravy, Grits, Fried Apples, and Pancakes. 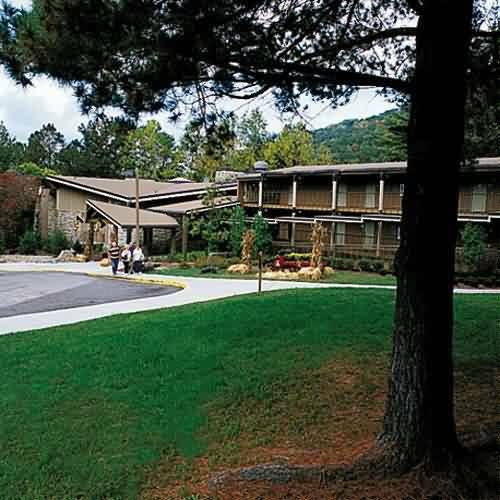 If you can attend one of the many conferences, workshops or seminars, you can eat at Pine Mountain Settlement School on the north flank of Pine Mountain. This is a spectacular facility in a magnificent location. 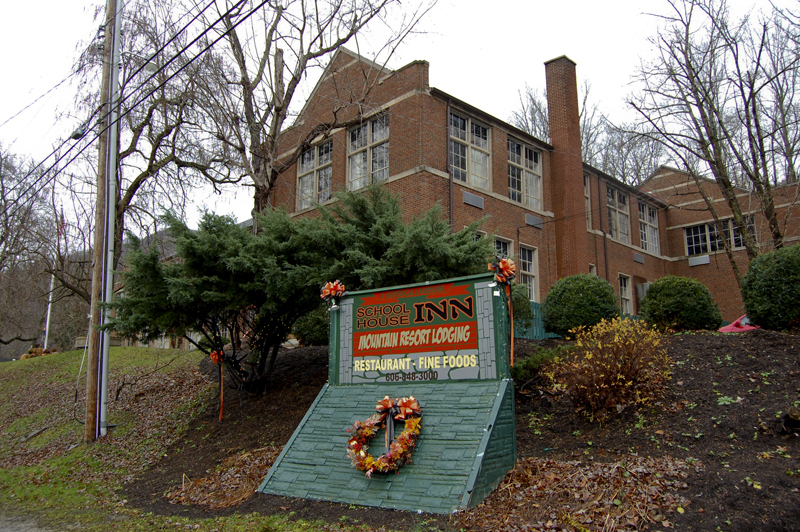 The building shown here is only one of many on the campus, which was a regular school for grades K-12 but now serves as an outdoor education center where other schools bring students on field trips. And it offers weeklong and weekend programs for adults, or by advance reservation you could stay in Laurel House and pay individually for your meals. 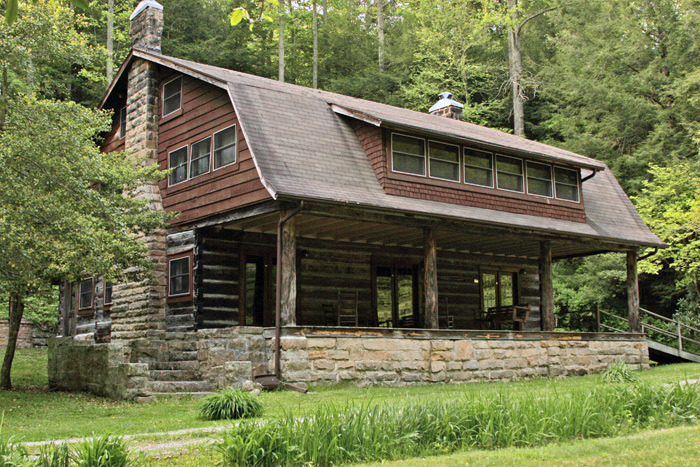 The Pine Mountain Settlement staff emphasizes sustainability. They raise their own vegetables and harvest additional items from the mountain forest. They rely on local sources as much as possible for the meat they serve. As a result, the meals are fresh and delicious with no pesticides, hormones, or preservatives. 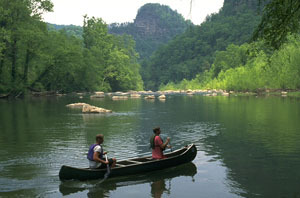 The best of their many programs is the Lucy Braun Appalachian Forest Ecology Workshop held every June. For a week you hike four to eight miles a day through various types of forest and study the underlying ecology. Then you come back and eat a great meal in these beautiful facilities. You'll come home smarter, fitter, healthier, relaxed and inspired. 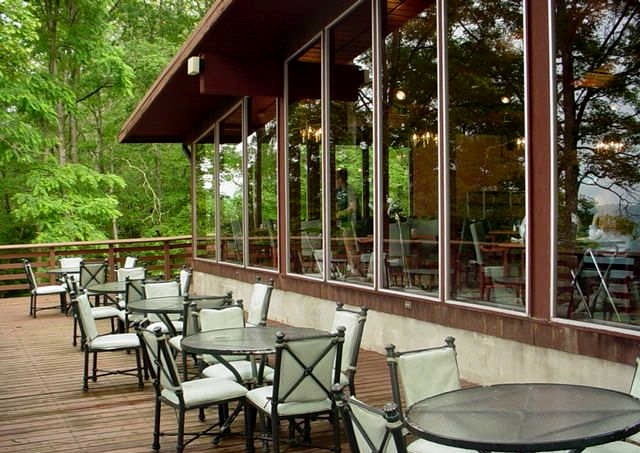 The Mountain View Restaurant in Pine Mountain State Park offers you a great meal with a great view facing west to the sunset. You could stay here in a room or cabin two thirds of the way up the mountain. The restaurant subscribes to the Kentucky Proud Movement, which means they use locally grown meat and produce and fix it without freezing or preservatives. The menu is not extensive and hours are limited (dinner is served only from 5-8), but what is offered is excellent. It's traditional mountain eating : Kentucky Hot Brown, Fried Chicken, Pork Chops, Country Fried Steak, Country Ham, Catfish and Trout. The usual format for dinner is a buffet with salad bar and dessert bar. In warm weather, if you're not in the mood for coffee, their Pink Lemonade is memorable. For breakfast, there are all the usual country favorites, but we thought the Grits were excellent and Cheese Grits outstanding. As spectacular as the view is at Pine Mountain State Lodge, it pales in comparison to the one at The Breaks Interstate Park's Rhododendron Restaurant, just south of Elkhorn City. You eat looking out over the deepest gorge this side of the Grand Canyon. And as good as the food is at the Mountain View, it's even better at The Breaks. 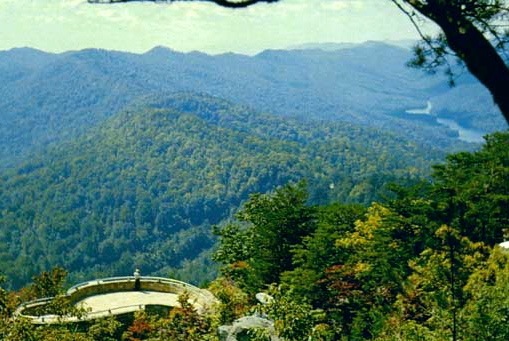 Kentucky runs this park in partnership with Virginia, since the state line cuts diagonally across the canyon. So the menu in the restaurant also reflects Virginia cuisine, adding a little variety to the usual Kentucky state park diet. The Country Kitchen in Buckhorn Lodge at Buckhorn Lake State Park near Hazard has gone a different direction in search of a unique identity. They've decided to become famous for breakfasts. 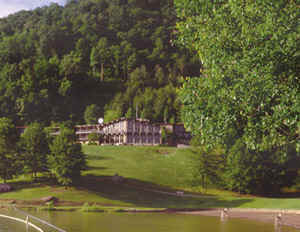 If you stay at the lodge overnight, you receive a free deluxe Kentucky Mountain Breakfast from 7-10 am. It includes biscuits & gravy, cheese omelettes, waffles, muffins, grits, toast, cereal, juice, milk and/or coffee. For lunch and dinner they also offer a Mountain Special of country style beans cooked over a slow fire with home fries, cole slaw and corn bread. The rest of their menu is the classic state park page of Catfish, Country Ham, Fried Chicken, Meatloaf, Ribs, Barbeque, Prime Rib, Macaroni & Cheese and Hush Puppies. Buckhorn participates in the Kentucky Proud program which means 80% of their ingredients are locally raised : meats, fruits and vegetables. The Music Highway Grill in May Lodge at Jenny Wiley State Park just outside of Prestonsburg have themed their restaurant after all the country music stars born and raised in that area. For their uniqueness they've added food favorites of those various singers and guitar players to their menu. They include Buffalo Strips, Mozzarella Sticks, Chicken Quesadillas, Fried GreenTomatoes, Sirloin Steak, Pork Chops, Beef Tips, Chicken Livers and Fried Shrimp. Then, of course, there's the traditional state park menu page of Catfish, Country Ham, Fried Chicken, Meatloaf, Ribs, Barbeque, Prime Rib, Macaroni & Cheese and Hush Puppies. The Kentucky Proud Program is in effect here, so 80% of their meats, fruits and vegetables are raised locally. 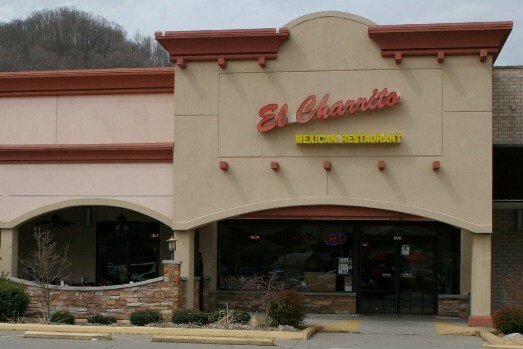 El Charrito, in the Village Center in Harlan, is the best Mexican restaurant in the mountains. It may also be the best restaurant of any type in Harlan. They feature very large portions at reasonable prices. Their signature items are Hot Chips, Fajitas and the Especial de Charrito, but their Quesedilla Cheese Relleno is outstanding. The menu is extensive. It includes seven Chicken entrees, seven Steaks and three Shrimp dishes. They also offer three interesting combination dishes. One is the Three Amigos. It includes Chicken, Steak and Shrimp , onions, shredded cheese, rice, lettuce, guacamole, sour cream and pico de gallo in a flour tortilla. The Chuletas a la Mexicana consists of two grilled Pork Chops with rice, pico de gallo, grilled onions, refried beans and tomatillo sauce. The refried beans here are actually pretty good. They're smoother and creamier than the usual dry stale version. But it's the Especial de Charrito that has become the favorite of most loyal Harlan fans. This feast includes fresh vegetables, spices, marinated beef, sausage, shrimp and chicken served in a cast iron skillet still hot and sizzling. This is available in one or two person skillets. The "two person skillet" is really enough for four reasonable adults.